My friend, as it happens, is an anthropologist. For one enthralling moment he thought he had stumbled upon a tribe in the west of Ireland which personified aspects of the weather, speaking of Mrs. Hailstorm, Master Sunshine and so on. But it was just another case of international miscommunication. Most people know that when a British schoolteacher asks his pupils to take out their rubbers, he is inviting them to produce their erasers, not about to give them a lesson in contraception. British people who live in flats do not set up home in burst tires. The word “bum” in British English means buttocks as well as vagrant. People in Britain do not usually say “I appreciate it,” have a hard time, zero in, reach out to other people, stay focused, ask to be given a break, refer to the bottom line or get blown away. The word “scary,” as opposed to “frightening” or “alarming,” sounds childish to British ears, rather like talking about your buttocks as your bottie. Brits tend not to use the word “awesome,” a term which, if it were banned in the States, would cause airplanes to fall from the sky and cars to lurch off freeways. The phrase “to feel comfortable with” is quintessentially American. The British would not usually say “we feel comfortable with using this taxi firm,” any more than they would feel comfortable with being scourged until the blood ran down their thighs. Americans tend to say “Excuse me” when they accidentally get in your way, while the British say “Sorry.” Americans say “Excuse me” even when they are 10 paces away from you, since they are accustomed to a lot more space than we are in Europe. One knows one is back in the U.K. when everyone is constantly saying sorry for no reason whatsoever. Americans tend to lapse into the present tense when speaking of the past much more commonly than Brits do. “I’m in the kitchen and there’s this terrific bang and I dive under the table” is distinctively American. Perhaps the British rate the past more highly than their trans-Atlantic cousins. People in Britain might call children kids, but not in newspaper headlines or on television news. Americans tend to prefer the ugly monosyllable “kids” to the rather beautiful word “children,” seemingly content to regard their offspring as small, smelly goats. 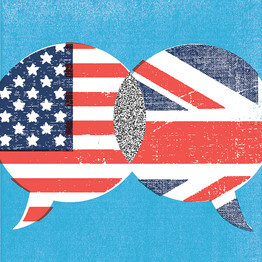 Brits and Americans, in short, are more alien to each other than they usually imagine. Every now and then, an American will reveal that he or she does not understand the word “fortnight,” has never used a teapot or does not know how to boil an egg. At such times one can feel the NATO alliance straining and buckling. Posted on 27, June 2013, in Humor and tagged Across the Pond: An Englishman's View of America, Anglo-American, British, essay, humor, humour, Terry Eagleton, Wall Street Journal. Bookmark the permalink. 5 Comments. my sisters American ex-husband said he couldn’t follow the conversation when she was talking to another British person! I wonder of British people have less of a problem understanding American speech is because we get more exposure to it via films (which you call movies) and TV. That’s possible! I think a lot of Americans don’t realize the number of British dialects there are. Not everyone sounds like the Queen or like Audrey Hepburn in “My Fair Lady”! I find the American accent far easier to understand than some of the British regional ones.